From its inception the sensors had built-in email alerting and could send SNMP Traps. 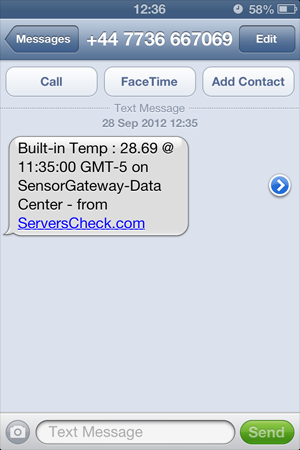 With the latest evolution of its hardware and firmware, ServersCheck SensorGateways can now send out alerts to you as a SMS (text message) or call you on your phone and read out the error message. No PC required. Do you have the Cellular Add-on? SMS Alerts are sent via the SIM card that you inserted into the device. You can ignore the rest of this page. Don't have the Cellular Add-on? Don't worry we have you covered too. How does it work? The SensorGateway will on alert connect through the Internet to one of ServersCheck's load balanced Alerting Gateways. The connected Gateway will then verify the account's settings and credits. If your account credentials are correct and if you have sufficient credits, then it will send out the received message from the SensorGateway as a text message to the defined mobile numbers in the account. The voice call and SMS alerts can be sent to multiple mobile numbers.